H-B Woodlawn Secondary Program eighth grader Siddharth Advani was selected to the American Choral Directors Association (ACDA) 2019 National Middle School/Junior High Honor Choir. Advani proudly performed on March 2 at The Kauffman Performing Arts Hall in Kansas City, Mo. 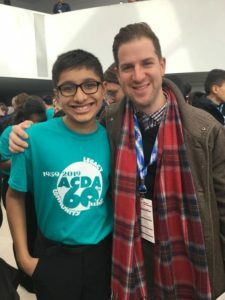 A devoted singer, Advani is a member of the H-B Woodlawn choral department and has been selected to perform with the All-District Honor Choir for the past two years. Over 1,200 students from around the country submitted auditions to the National Middle School/Junior High Honor Choir for which 300 were selected to participate. Selected students rehearsed challenging repertoire over four days in preparation for their ultimate performance under the direction of conductor Derrick Fox in St. Louis.